Thatch is made up of a tightly woven layer of roots, living and dead stems, and leaves. It is located between the soil and your living turf (grass) and is a normal part of an actively growing lawn. Since it is not too thick, thatch helps the resilience of your yard when it is exposed to high traffic. High-maintenance lawns develop thatch more easily than low-maintenance lawns. If too much thatch develops, it reduces the ability of grass roots to get air, water, fertilizer and nutrients. Lawn dethatching is best done with special machines that you can rent from home and garden centers, or you can contact a lawn care professional to remove excessive thatch for you. Lawn dethatching can be done with the following pieces of equipment: verticutters, vertical mowers, dethatchers, or powered rakes with vertically spinning blades. These tools pull some of the material to the surface of the lawn as they slice through the layer of thatch. 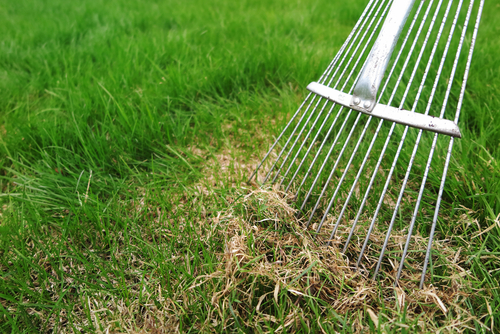 If you need to dethatch your lawn, do it when you have cooler weather in your area (typically early spring or late fall.) You should not try to remove the whole layer of thatch in one treatment. Only dethatch when it is necessary, and do not attempt it when the grass is wet. Consider aerating and liming your turf if needed after lawn dethatching. You will improve the ability of your lawn to resist drought, reduce the chance of diseases, and make your lawn more resilient and healthy if you dethatch when necessary.